The highly respected and ever prolific Dutch violinist André Rieu, a great friend of the lateMOR genius James Last, is Maastricht’s most famous resident. A global traveller with worldwide successes to match his output Rieu is known for creating the waltz-playing Johann Strauss Orchestra whose popularity matches or exceeds many a rock and pop phenomenon when it comes to stage performance. One of the violinists who deserves (and can afford) to play a Stradivarius, Rieu owns the 1667 model, one he has often compared to the female form. As he says: “It's not only a Stradivarius, it's THIS Stradivarius. A violin is really like a woman. She is unique. There are many women but only one woman you love. With a violin it is the same.” He spent much time searching out his instrument. “Yes, it is really difficult until you get entrance into the violin world.... It's a small world; only 3 or 4 people determine that over the whole world. And once they knew that Andre Rieu was looking for a violin and preferably a Stradivarius. They came like flies to honey. It was unbelievable; I did nothing. They came from the other side of the world with violins saying: come, play. I actually had many different Stradivari under my chin to try out but it was very difficult because it is such a important decision.” As one of modern classical music’s genuine superstars Rieu hasn’t always been able to satisfy those critics who would keep the great composers of the Baroque and Romantic movements covered in aspic and under glass in dusty museums, but since this man weighs his royalties rather than read them on a spreadsheet, he should care less. Still often playing over 100 concerts a year, the youthful 65-year old and longhaired figure he cuts is so charismatic that he is viewed with awe by his fans: from Holland to Germany and London to New York, they flock to his concerts with tribal fervor. Heavily honoured in Holland and also in France (he is a Knight of the Ordre des Arts et des Lettres, Rieu has done more than most to rescue classical music from a time warp and bring it to modern tastes. He is also canny enough to mix theme music, movie soundtracks and golden pop standards of the 20th and 21st centuries into his repertoire. Music maestro, please. Coming from French Huguenot stock Rieu also hails from a highly trained musical family. His father was conductor of the Maastricht Symphony Orchestra. A fascination with the orchestra and a burgeoning brilliance as a violinist and conductor took André to the Conservatories in Belgium and Holland. He formed the Maastricht Salon Orchestra as a small enterprise in the 1980s but saw no reason to limit his ambition. The Johann Strauss Orchestra and the formation of his own production company took him into the stratosphere long before the moguls of R&B and Hip Hop realised that diversification was the name of the game. Specializing in the waltz revival, he has become known as the “Waltz King” (a title originally bestowed on Johann Strauss 11). Since the orchestra expanded so did Rieu’s repertoire and he includes all forms of crossover and makes an art form out of easy listening. Having released almost an album a year since 1982 Rieu’s full achievements would need a tome or five to do them justice. Suffice to say he has been well described as a phenomenon. He's Pavarotti, the Boston Pops, Nigel Kennedy, Liberace and PT Barnum rolled into one. He's a heart-throbbing chart-topping star of the Morning Melodies set whose popularity puts the Three Tenors to shame. The epic Romantic Paradise really pulls out all the stops as it covers Morricone’s “Once Upon in The West”, "The Girl from Ipanema”, “The Godfather”, “La Paloma” and “Blue Spanish Eyes” with playful fervor. Renowned as the modern-day Waltz King, André Rieu is closely associated with the traditions of Vienna and the music of his orchestra's namesake, Johann Strauss. 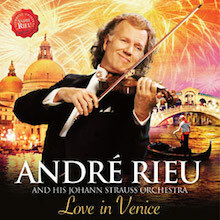 Yet for his 2014 release on Universal, Love in Venice, Rieu pays an imaginary visit to the south, shifting the emphasis from the waltz to the barcarole and tarantella, and highlighting the popular songs and dances of Italy. Of course, it wouldn't be a Rieu album without some waltz music, which can be heard in Strauss' Lagunenwalzer, but there's an effort to introduce a variety of pieces that create a sense of Italian atmosphere through sentimental melodies that are popular around the world. However, Rieu sometimes overshoots his intended location and performs music from Naples, as in the Neapolitan standards, O sole mio and Santa Lucia, or chooses pop songs that are more generically Italian, such as Volare and That's Amore. But the lush arrangements exude nostalgia for the past, if not necessarily a Venetian past, and set a romantic mood, which seems to be the main point. 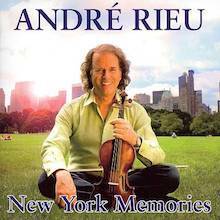 Rieu appears occasionally as violin soloist and provides his familiar orchestral and choral sound with touches of local color in the use of the mandolin and concertina. While this is not a purist's musical tour of Venice, this album is aimed at a general audience that will find it appealing for its lighthearted tone and lavish treatment. Queen's Day (30th April) is always a special day in Amsterdam and this year there'll be even more to celebrate as Prince Willem Alexander and Princess Màxima are officially inaugurated as the new King and Queen of the Netherlands. Earlier this year Queen Beatrix delivered an official address to the nation, announcing her upcoming abdication from the throne. This will take place on Tuesday, 30th April 2013 at the Royal Palace on Dam Square, followed by the inauguration of the new King and Queen at De Nieuwe Kerk. Rijksmuseum) during the King's Ball. The inauguration and festivities will be a world wide TV broadcast. 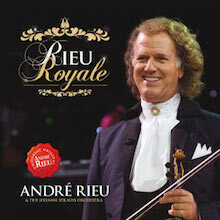 The Coronation Waltz is part of a special compilation album, put together by André himself: Rieu Royale. It also contains a fresh arrangement of the Wilhelmus, the Dutch national anthem, which is a first release on cd. "When I was small, only five years old, my mother gave me a violin. From that moment I had only one dream: when I grew up I wanted to go on stage and play to lots of people. I wanted to make everyone in the world happy with my violin. I didn't care how long it took me to get there. And now my fans all over the world have made that little boy's dream come true. I thank you all from the bottom of my heart!" On this CD I’d like to let you hear all the different sounds a violin can make, from passionate gypsy dances to the loveliest romantic pieces and the sweetest songs." If any contemporary musician merits Johann Strauss' moniker, "The Waltz King," it is assuredly the indefatigable André Rieu, whose scintillating concerts have delighted audiences around the world. 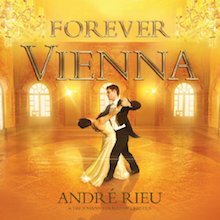 Forever Vienna, Rieu's 2010 release on Decca, is a representative sampler of his lively repertoire, and the violinist/conductor and his Johann Strauss Orchestra present a jovial mix of medleys and popular waltzes by the Strausses, Franz Lehár, Dmitry Shostakovich, and other composers whose dances have become familiar light classical fare. Most of the arrangements are Rieu's, and they display his characteristic whimsy and splashy orchestration, sometimes featuring a prominent violin part for himself, but often highlighting other musicians in enviable solos. The medleys are perhaps the most surprising and clever offerings, for Rieu occasionally inserts references to masterpieces that are far from the ballroom floor: the opening horn call from Bruckner's Fourth is a quirky way to open Danube Love Medley, a potpourri of waltzes, and who would expect Rossini's William Tell Overture or Suppé's Light Cavalry in the high-spirited Strauss Party? But as unexpected as these quotations are, they always work because of the music's buoyant humor and Rieu's charming way of letting his audience in on the jokes. The sound of these recordings is full, warm, and effervescent, and the evenness of volume over the tracks allows a comfortable home listening experience. 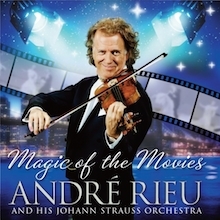 This is a fine collection of film music, nearly all from previous CDs and DVDs, so it is a good buy if you only have a small amount of Andre Rieu's work. The CD and DVD are each about 70 minutes long. The 2 adagios on the CD are from Beethoven's 5th piano concerto(track13) and Khachaturian's Spartacus(15). Most of the CD is beautiful and gentle music until the more lively Bolero and the last 2 tracks. One minus is the total lack of track information when played or downloaded to itunes. The DVD is a compilation from the following DVDs: Romance(track1), Romantic Paradise(2,3,4,5), Schonbrunn(6), Maastricht3(7,8), Maastricht5(9,14), Wonderland(10,11,12,13), Maastricht2(15). The last track, Zorba's Dance, is from this year's Maastricht concert. They are mostly excellent samples from his concerts apart from one or two rather kitsch videos, but the DVD jumps from one concert to another without any indication of the time or place. The playing and singing is superb throughout. This would not be a good purchase if you already have a large collection. On the other hand, it gives a very good taste of some of his best DVDs. 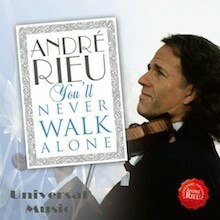 A new chapter in André's discography unfolds with his album You'll Never Walk Alone. This is an André Rieu "Songbook" - and the songs are those of hope and inspiration. While retaining everything about the sound of his recordings that his fans know and love, André ventures further, evoking the sound of great orchestras of the 1950s and 1960s. The program is music entirely new to his discography, and they include tracks requested by fans (two of these being the huge 1960s hit Elizabethan Serenade as well as Nearer, my God, to Thee) to songs from musicals - two from My Fair Lady and one from The Phantom of the Opera. There are classical favourites beloved by all - Beethoven's tranquil Moonlight Sonata and Elgar's Land of Hope and Glory. There's a song that for a time acquired pop status - Time to say goodbye. And in a similar vein, André as composer in Yours Forever, a song he wrote for the victims of the recent Australian bushfires in Victoria. And then there's the title track - a huge sporting song in the UK with no less currency in this market: You'll Never Walk Alone. Wherever we go on stage, I feel deeply gratified looking at the happy faces in our audience. That and playing with the Johann Strauss Orchestra is what I love most about performing concerts. But there is one show I look forward to the whole year – and my orchestra feels the same way: the traditional summer night’s concert on the Vrijthof, the big square in my hometown Maastricht. The atmosphere is breathtaking. With its medieval churches and historical buildings, and its many terraces, the Vrijthof is amongst the most beautiful and homely places I know. From all over the world people come into the city of Maastricht to be part of this unforgettable show. And even when the show is long over the audience still stays on the square to talk, dance and sing the melodies we’ve just played. I love this city more than any other place in the world. When the sun goes down after a beautiful day, a quiet stillness pervades the surroundings. The sounds of the daytime fall away, with just a bird here and there singing a last song for the night... I love that transient time of day. It brings warmth to my heart. Music of the Night, my new CD, is inspired by that very atmosphere and I hope the music I have selected to record for you re-creates just that ambience, whenever you choose to listen to it. So let yourself feel the warmth of the sun’s last rays, or stare into the fireplace’s last embers on a winter’s evening while you dream away to Yesterday, When winter comes, Hymne à l'amour and the many other beautiful melodies for the night. 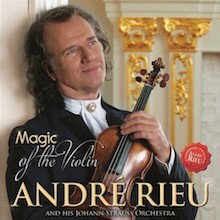 CD "André Rieu celebrates ABBA"
When I was asked to record a CD of music by ABBA I was so happy, I jumped for joy! I also felt it was a great honour. For me ABBA is the best pop music ever! It’s great to dance to and it always gives you a happy feeling. My orchestra and I had a wonderful time recording their songs. It was a great experience. Thank you for the music, ABBA! You're the greatest! 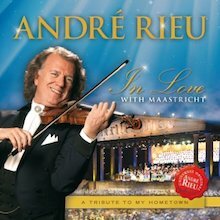 If you've ever wondered what happened to the easy listening music of the 1960s, it lives on, pushed somewhat in the direction of the classical repertoire, in the music of Dutch orchestra leader and arranger André Rieu. As with the easy listening bandleaders, particularly Percy Faith, Rieu has imagination and talent; his durable success is no accident. The listener who has encountered Rieu's music during Public Broadcasting System fundraisers and the like will encounter a bewildering variety of produce when first searching for something to buy; Rieu, like Luciano Pavarotti, has been the victim of reissuers and recyclers who have dug up music he recorded years ago and slapped new covers on it. The buyer can rest assured that this recording of New York Memories is a good pick. Despite the pictures of the Big Apple spread across the poster-like liner material, the album was recorded in a studio in Maastricht (the credits make no exception for two seemingly live bonus tracks featuring the Harlem Gospel Choir). The American content is reflected in the program's orientation toward American music (and rock and pop in general), and this allows Rieu to show how skillful he is at incorporating a variety of material into his sound. Listen to "Seventy-Six Trombones" (track 9) or Sousa's Washington Post March (track 11), where Rieu performs the subtle trick of incorporating his wordless background vocals into the refrains and thus taking the edge off the bumptious march rhythms. Check out his unique version of "A Whiter Shade of Pale," which just hints at the organ part in the original song while turning it into a Rieu string spectacular. Hear the over-the-top version of "America the Beautiful," or even the two gospel bonus tracks -- Rieu is emotionally open enough that he actually captures the feel of these and matches the choir better than many European performers do when confronted with this music. Other standouts here are "I Will Follow Him," which many U.S. listeners may not realize was originally composed by Paul Mauriat of "Love Is Blue" fame. 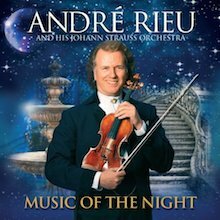 This is a well-recorded Rieu album, not exactly a typical production (his usual fare tends more toward light classical music), but one that puts the talents of this modern-day waltz king on full display. 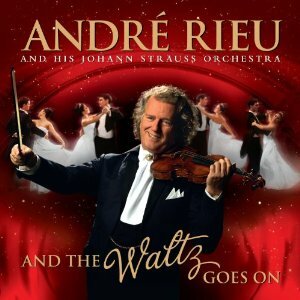 Featuring an array of traditional waltzes from Finland ("Valse Triste"), France ("La Petite Valse"), and Austria ("Wien Wird Bei Nacht Erst Schon"), And the Waltz Goes On is the 2011, globe-trotting second release from the prolific Dutch composer and violinist André Rieu. Its 20 tracks include orchestral reworkings of show tunes (Phantom of the Opera's "The Music of the Night," "Singing in the Rain") and easy listening standards ("We'll Meet Again," "Are You Lonesome Tonight"), alongside a collaboration with soprano Hayley Westenra ("Dreaming of New Zealand"), and the title track, an original composition penned by none other than Sir Anthony Hopkins.